So here I am in the red Deb Ball chair. Putting up my Chucks. (I always sit cross-legged, like a five-year-old.) Comfy. Are we allowed wine in the chair? Why not, right. Might as well celebrate. This week has been the culmination of so many years of dreaming (and then finally doing something about it). A lifetime. I’ll get to the questions my fellow Debs have selected for me in a second. 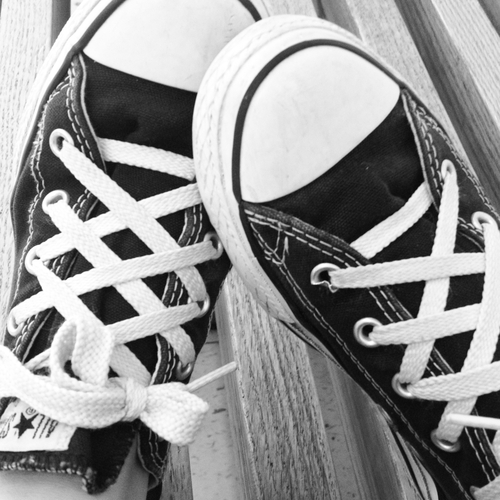 I just want to say that if any of you readers are in the same shoes (not the Chucks, the other part, about writing), you are the one who has to make it happen. Take permission instead of asking for it. Add it to your to-do list and put it first. If that sounds like a big old lot of work, well, it is. But if I can do it, she-who-loves-her-couch, then you, too, can do it. I swear. Put in the time. Keep writing. OK, ladies of The Ball. Let’s dance. Natalia: What’s been your one happiest moment so far on this journey? I’ve had several great moments related to The Black Hour—but it’s been over four years since I started writing it! I know that I will never forget sitting in a rented Wisconsin lake house in July 2011, typing “the end.” Of course that was really the beginning. Top moments that come to mind: finishing the draft I knew was the one I’d start to submit, talking to my agent for the first time (I was so nervous!). And of course the moment when I knew The Black Hour would be published was so great and rewarding. But I keep coming back to that moment when I finished the first draft. Writing, in the end, is the reward for publishing. Not the other way around. I should remind myself of that more often. Although I think seeing the book out in a bookstore is going to be KILLER. Lisa: What’s your secret to crafting fully realized, engaging, dynamic characters? I like this question a lot, since it sort of assumes that Lisa thinks my characters are awesome. Unfortunately, she also seems to think I have a secret for making them so. I guess if I had to say I had a process for building characters, it’s that I honestly try to think of them as real people. And real people, as we all know, have multiple layers of problems. You don’t want to spend a lot of page space on character problems that don’t feed the story, but you do want your character to live fully in the world you’re building around him or her. Without doing those long character interviews (which I’ve never done), you could think about the specific age of your character. What is a person that age thinking about? What is he or she putting on hold to solve this mystery or get to the bottom of this story problem? What is the family situation? Who’s begging for her time? One piece that I always try to examine is the character’s relationship to money, whether they have some or not. (Many of my characters do not because that’s my background and I want those sort of characters in the books I read.) Decide how your character sees the world, and then show that world to your reader. Build the evidence. Heather: If you could go back and give your pre-pubbed self one piece of advice, what would it be? Unpublished Lori? Published Lori here. Honey, you really need to write more. You will never regret having extra story drafts in the drawer to come back to. You will never regret having extra words that need to be chopped. But the blank page is not your friend. It’s a big bully. Don’t let it push you around. Susan: What part of the process of publishing your first novel was the biggest surprise? I did a lot of research (uh, maybe too much) about publishing before I was even close to being a part of it, so very little has surprised me. That said, it’s weirder than I thought to have so many people invested in the production of your work. You spend so much time working alone on a novel—for me, it was about two and a half years—and then suddenly all these other people have opinions on where your commas go. (I was also surprised by how bad my comma use was. I never met a comma I didn’t use.) It’s fantastic to have so many people at your back helping you make your book the best it can be. That’s the true benefit of traditional publishing: you have a team. You get used to having them pretty fast, too, because they are so positive and supportive of your work. I’ve met a lot of amazing, generous people since getting into the crime fiction game. It’s been great to meet so many people who make books their lives. We’ve all heard stories about how things didn’t go the author’s way, right? I guess I was prepared for less things to go my way. I was prepared to cry over my cover, but I loved it. I was prepared for my publisher to take away my title, but they kept it. It’s probably better to be overly prepared by research for the worst, so that all your surprises are pleasant ones. Disaster preparedness, literary style. GIVEAWAY! Comment on this post by noon EST on Friday, July 18th, to enter to win a signed copy of THE BLACK HOUR—US addresses only, please. Follow The Debutante Ball on Facebook and Twitter for extra entries—just mention that you did so in your comments. We’ll choose and contact the winner on Friday. Good luck! Excellent post, and this is a great line: “But the blank page is not your friend. It’s a big bully. Don’t let it push you around.” Looking forward to reading THE BLACK HOUR. Congratulations on your debut! It has been quite an education following Lori’.s posts over the last year +. It has been great to see such a positive person go through the process, and even more enjoyable to see the positive reviews roll in. Of course this post was easy to relate to since I also tend too use too many commas (and then also manage to miss some spots where there should be one). Thank you, Sam! You’ve been so supportive. Hope to see you again soon! Truer words never spoken. Congratulations again on your launch week and wonderful book, Lori! Thank you! Can you believe we did it? Five launches, complete. “Writing, in the end, is the reward for publishing.” Very good way to look at it. A few decades from now, which will you be more proud of? I’ve never done character interviews either. It seems very nosy, and besides some of my characters wouldn’t react well (sullen silence, cursing, fists, and maybe worse 🙂 ). I love the Anne Lamott quote. I’d hate to meet the person who saw Amadeus and identified with Mozart. I think the vast majority of us feel more like Salieri, working hard for every note. Well I do want my stories to be read so there’s that…but I’m missing the writing this week. I’ve already shared your novel with two people and now my mom has it! Woot! 🙂 So proud of you and glad to know you. This is a wonderful book. Thank you! Thanks for making me some new fans! Congratulations on the book. I’m looking forward to reading it. This book sounds amazing! Congrats, Lori! I am entering the contest. Relatively new Deb Ball follower / stalker. 🙂 One random question. The site is really wide and I can’t get my mobile browser to zoom in. (I do most of my reading while nursing. 😉 Baby is 5 weeks old so you can guess how long I’ve been reading…) Anyway it’s super hard to read on mobile because it is x pixels wide and won’t shrink to fit my screen. but don’t worry. I won’t stop reading!